Using a new imaging technique, NIH researchers have found that the biological machinery that builds DNA can insert molecules into the DNA strand that are damaged as a result of environmental exposures. These damaged molecules trigger cell death that produces some human diseases, according to the researchers. The work, published online on November 17, 2014 in Nature, provides a possible explanation for how one type of DNA damage may lead to cancer, diabetes, hypertension, cardiovascular and lung disease, and Alzheimer’s disease. Time-lapse crystallography was used by National Institute of Environmental Health Sciences (NIEHS) researchers to determine that DNA polymerase, the enzyme responsible for assembling the nucleotides or building blocks of DNA, incorporates nucleotides with a specific kind of damage into the DNA strand. Time-lapse crystallography is a technique that takes snapshots of biochemical reactions occurring in cells. Samuel Wilson, M.D., senior NIEHS researcher on the team, explained that the damage is caused by oxidative stress, or the generation of free oxygen molecules, in response to environmental factors, such as ultraviolet exposure, diet, and chemical compounds in paints, plastics, and other consumer products. He said scientists suspected that the DNA polymerase was inserting nucleotides that were damaged by carrying an additional oxygen atom. After the DNA polymerase inserts a damaged nucleotide into DNA, the damaged nucleotide is unable to bond with its undamaged partner. 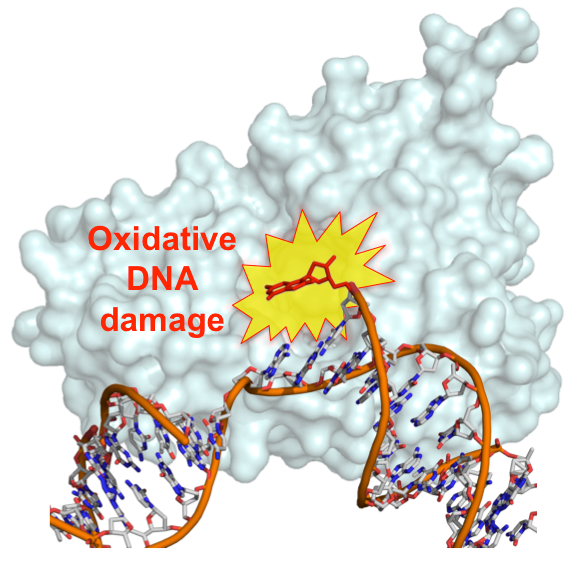 As a result, the damaged nucleotide swings freely within the DNA, interfering with the repair function or causing double-strand breaks. These steps may ultimately lead to several human diseases.